Okay, take 2 folks XD. It's my first drawing of 2013:). After looking at the previous picture of her I did, I felt that there were things that I could've done better on, so I decided to do a second picture of her using the same Pokemon card I used as reference to do the first drawing. This time though, I also made use of the Pokedex I have on my 3DS so I could get views of Latias from a few different angles. This allowed me to have a much better idea of how to draw some of the details I had trouble with in the previous picture:). Personally, I think this one turned out much better than the previous one I drew. Sorry for the poor lighting:/. This is a photo, not a scan. God I need a scanner XD. 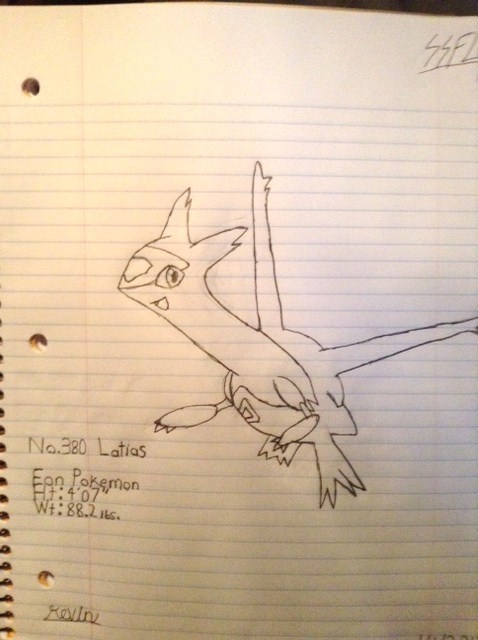 Pokemon and the name and likeness of Latias are property of Nintendo. You may want to build yourself a tripod, to hold the camera still. Have it hang over your drawing which lays flat on the ground. The main problem for me is the lighting. The flash makes the lines turn out too transparent. But I actually never thought to try using a tripod. I'll give it a shot and see how it turns out. Thanks for the advice^_^. Before I got my scanner I taped duct tape over my old camera flash (Stupid flash Y U NO turn off?) and taped it to the bottom of a coffee table. The results were... passable.